SHOP TO HELP THE ANIMALS!!!! The hardest part about animal rescue is getting in a beautiful animal and then finding out that it is ill, injured, or some other reason leaves this Earth unexpectently. All the special beautiful babies below touched our hearts if it was for a few days or months. 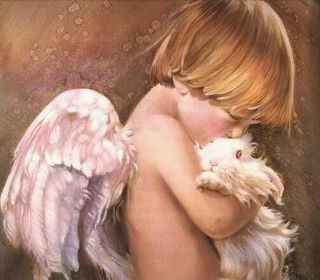 We will miss them and pray that they will be safe until we see them again at the Rainbow Bridge. UPDATE: Too soon after Norma was adopted her family let us know that she had gone to the Bridge. We are thrilled that she was able to be spoiled and know the love of a forever family but devasted that her time came too soon. The family has also let us know that her husbun misses her terribly. We will miss you Miss Norma. 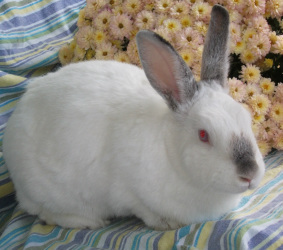 ​Norma Jean was a stray left in a box at a City Pound with another of our rabbits, Giselle. 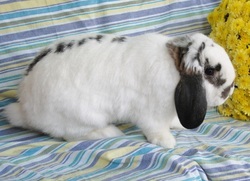 Now Norma Jean was living in a great home with Journee, another of our rabbits. ​ We were devastated to lose Kate. Thank goodness that while she never found her forever family, she knew tons of love and attention from the Wonderland "family". She adored living next to Eduardo. They didn't want to live in the same pen, but would lay next to each other through the fencing. Eduardo misses her greatly. Godspeed Katie! 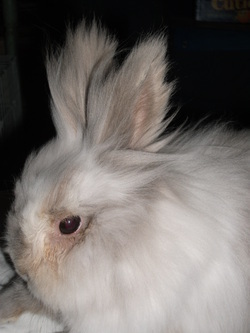 Kate was the mother of Tony, Ducky and Gibbs, all which have been rehomed.. She came to us in February 2012 with her 3 babies and another rabbit who has since been rehomed. 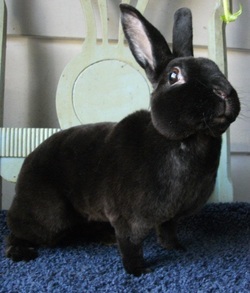 This black little rabbit is Onyx, the surprised mother of 8 little babies!!! We rescued Onyx, the sweet little black rabbit above, that someone had dumped in a subdivision very near a large woods full of predators. She is only about 3 1/2 pounds and is so young that she hasn't decided if she is going to be a lop or not. Usually one ear is up and the other is down. Only after one week of having her, a trip to the vet confirmed that indeed she was pregnant and that there were at least 4 little babies on their way any day. Sure enough she gave birth to EIGHT!!! Unfortunately 1 day after birth she lost one of the babies and the next day she lost another. In honor of her name being Onyx, the two babies - which are two of the black ones pictured above - we named the two little lost babies Diamond and Sterling. The remaining six continue to grow daily and will be quite a handful soon!!!! Lilac came to us with her sister, Pearl, on July 12, 2015. They were in isolation and all was going fine until Sunday July 19. I went to feed them and Lilac was breathing heavy, her nose was crusty and she was very limp and lethargic. I grabbed her and rushed her (and her sister) to the Emergency Vet. Our problem around here is that the closest Emergency Vet that will see exotics. Ours is approximately 1/2 an hour away. Sadly, Lilac died in my arms maybe 10 more minutes until we reached the vet. We continued on and had Pearl checked over and took Pearl the next day to our vet and she is in extended isolation and is on preventative medication. This is just an example of how fragile these gentle creatures are and how you should be prepared in any emergency to pick up and dash and know exactly where your emergency vet is, their hours and how to quickly get there. We didn't have you long Lilac, but Pearl misses you very much. We have no idea what happened. We think it may have been a heart attack. She was 6 years old and as a large bunny it very well could have been. We only had her a month and it saddens us because the person that surrendered her did so because he had a severe sudden allergic attack and they found out he was allergic to buns. Cupcake came to us with CoCo, a Flemish Giant, but Cupcake was the love of her daddy. It broke our hearts to have to tell him. We had her cremated and got a "Flat Bonnie" (see their website at http://www.flatbonnie.com) and gave her ashes and favorite blanket along with the look alike Flat "Cuppie" to her former daddy. 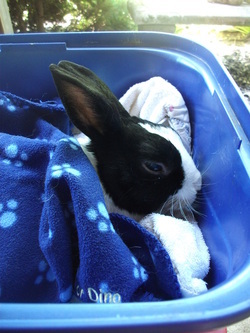 He was surprised and overwhelmed and was glad he could take her home to be with a rabbit that they had had before. It breaks my heart to see good people that have to make the tough decision to turn over a beloved animal to a Rescue only to have that animal pass away. Its one of the toughest things about doing Rescue work. Unexpectedly and sadly we lost our little warrior princess Xena today. 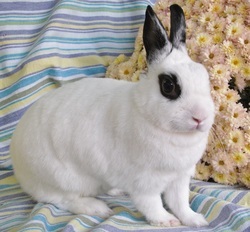 Xena came to us in 2012 and was paralyzed during her spay. Through her own tough spirit and never give up attitude she taught herself to sit up, get around and even hop!!! 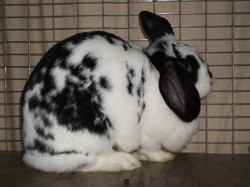 She lived in the Sanctuary in a beautiful pink soft sided pen that her Sponsor Robbin Sobel got for her and loved wearing her pink diapers and socks and doing her own special hop all over the Rescue to visit with all the other bunnies. Xena showed no sign of illness and died very suddenly in Jerry's arms as he picked her up to give her kisses as he did every morning. We were blessed to have her with us, although for far too short a time, and will miss her greatly. She taught us so much on a can do spirit and never giving up in the eye of adversity. Binky free little girl. Give those other bunnies at the Bridge a run for their money!!! Love you forever and ever. 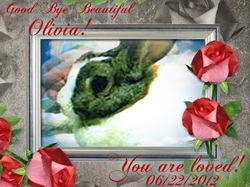 We are sad to announce that Olivia passed to the Rainbow Bridge today. On Sunday the 17th, we rescued her from a horrible situation. She and three others we rescued were going to be taken down to Alabama and slaughtered for dog food for a show dog that is allergic to beef and chicken. The woman who was going to take her down felt sorry for the bunnies (I think she has 12 total) and put an ad up on Facebook. Our web designer, Kelli Polley, found the ad on Craig's List and forwarded it to us. We brought the rabbits to the rescue, did an initial intake, clipped nails, weight, etc. and got them set up. We noticed Olivia was very frightened and wasn't eating. She went to the vet the next day, who put her on Cisapride and peace and quiet and said to see what happened. This morning we went out to give her Critical Care and she was mouth breathing. We rushed her to the vet where she was running a temp of 104 degrees Farenheight. The vet kept her under observation during the day and called around 5pm to say that she had passed. While we never really got to know her, she was an adorable little girl and she will always have a very special place in our heart. God bless you and keep you little Olivia.